The pale lemon petals of the wild primrose are a welcome sign of the changing seasons. Primrose means 'first rose' and, although it's not related to what we'd call a rose today, it is among the earliest of spring flowers. In milder years these hardy little plants can bloom as early as December but it's not until April that they really come into their own. This month sees the celebration of Primrose Day, a tradition that started in Victorian times to honour the late Prime Minister Benjamin Disraeli. He was a close friend of Queen Victoria and when he died on 19 April 1881, the Queen sent a wreath of primroses to his funeral with a note saying they were "his favourite flowers." It’s not clear whether the Queen's note was referring to her late friend or her late husband, Prince Albert, but people followed her example and paid tribute to Disraeli by wearing primroses and placing them on his statue in front of Westminster Abbey. The botanist Sir George Birdwood then proposed an annual Primrose Day and the custom has been observed on 19 April ever since. 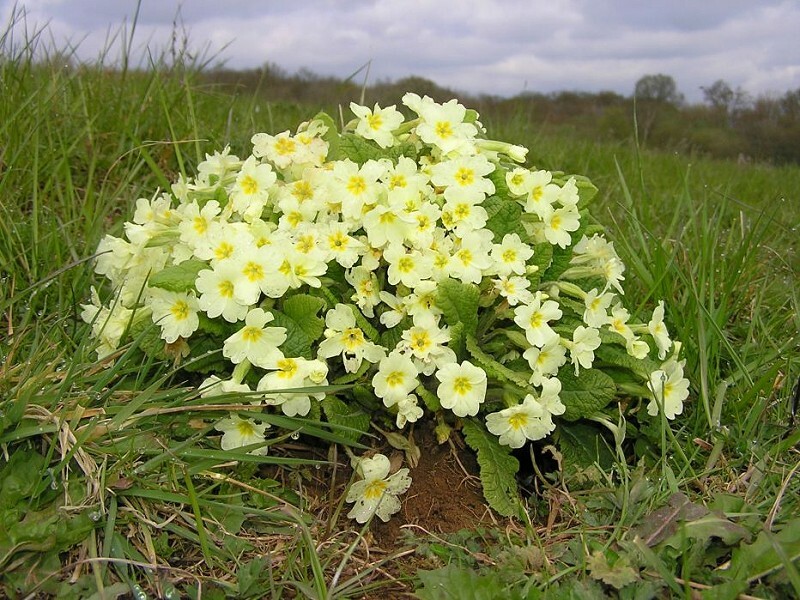 The primrose has long been a symbol of spring and, perhaps because of the way the plant grows in a rosette like a natural posy, the flowers were often picked to give as presents and decorate churches, especially at Easter. Such a popular plant earned a variety of local names including 'Easter rose' and 'darling of April' in reference to the timing of its flowers, while 'butter rose' and 'golden stars' describe the colour of the petals, which can range from almost white to deepest gold. A closer look at the deep yellow centre of each flower will reveal either a tiny green ball poised on a slender stalk, known as a pin; or a ring of yellow stamens, known as a thrum. Pollen must be transferred from one flower type to another for the plant to set seed, and this task is ably fulfilled by the early spring bees and butterflies that feed so eagerly on the primrose's abundant nectar.